The season has finally begun! The month of March is the month where the pros start to rivet for the oncoming season. We had an amazing Tirreno-Adriatico with great cycling accompanied with great weather, and some great climbs.Forget about the winner..Already too many people talk about the winner of this event. Then few days later we had la"La classicissima" Milano-Sanremo, where the weather was not the best for cycling, as 86 riders retired from the horrendous weather? I would ask myself why? did not have enough clothes to warm up,or was it too cold, or they don't get paid enough..whatever..Hat off to those have finished the race. 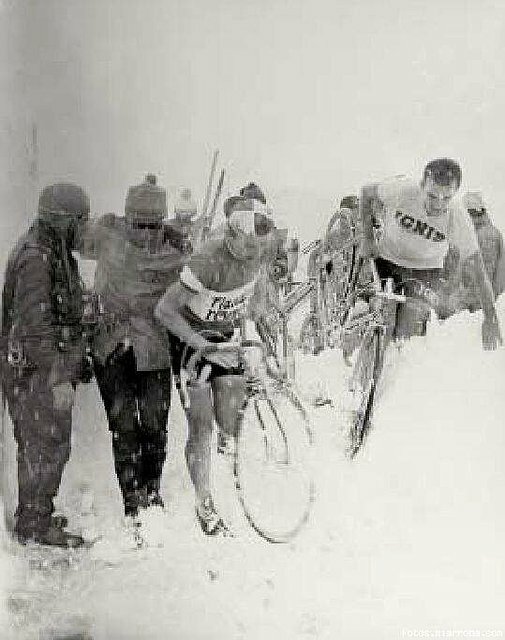 Instead thinking the reason behind all this DNFs, I rather watch this nice video from 1922 and many other from "La classicissima" or any other races where nature prevailed on the riders.Where those from the past, carried on with no problem at all with their "man bits" up to the throat for the cold. No turbo trainers in the past. Then we are at the beginning of the season, everyone will be talking about the same stuff in and out, left and right,top and bottom like the last 15 years or more. The main concern that everyone should talk about and reflect,it is that cycling has become a "prima donna" sport like many others. A lot of cyclists like to follow the Velominati rules,but they buy turbo trainers and train with Sufferfest. Having tons of bicycle for each occasion.This is not cycling.I would call it differently.But I have to stop myself. All of this has to be taken in consideration, that if we carry on with this mentality, cycling will be destroyed by literally nothing. My final conclusion is that the season has begun, how many races will we watch with nearly half of the riders with DNFs? Cycling is for passion. Cycling is the connection between the human body with nature.